'Two trees in Nelson, planted by the late Henry Seymour in 1842. One grows on the road in Seymour Avenue, near the house of Mr. Cockburn, the other on private property near the bridge at the S.E. side of the avenue. Mr. Seymour had been secretary of the Cheltenham Horticultural Society, and brought out acorns to Nelson with him. " A high flood shortly afterwards washed one of the seedlings away, but a diligent search led to its recovery over a mile away on the banks of the Maitai River, of which the brook is a tributary. The seedling was brought back in triumph and this time was planted in the field at a safe distance from the Brook." (letter from Mr. F.G. Gibbs). Ref. 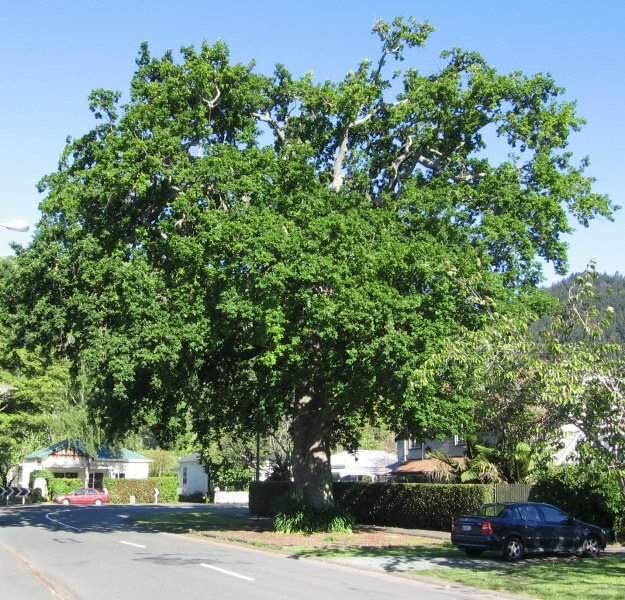 Historic Trees of New Zealand. Consolidated List from Journals of the Royal N.Z. Institute of Horticulture. June and September, 1940, June 1941. ‘Known as the ‘Fell Oak’ this tree was planted 1842-43 by either Seymour or Fell. It was shortly afterwards washed away in a flood, but later found on the banks of the Maitai River and replanted further away on higher ground. Probably the first English oak to be planted in the region’ (S.W. Burstall). Ref NZ Forest Research Inst. Forest Mensuration Report No. 21, 1974 (unpublished) page 25. A fine massive specimen in good health. This tree has a plaque from the Historic Places Trust which reads "Planted by Henry Seymour in 1842 and replanted by Alfred Fell the following year" (Oliver 1983).